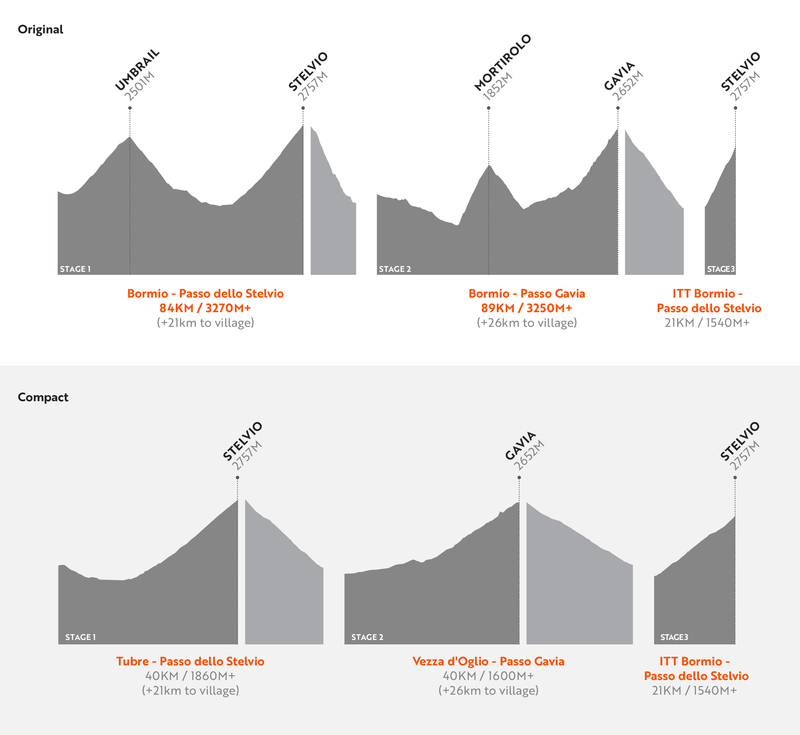 Following the recent course announcements for the Haute Route Alpe d’Huez and Haute Route Ventoux, details were revealed today for the 2019 Haute Route Dolomites (June 7-9) and Haute Route Stelvio (September 20-22) courses. Highlighting the finest cycling that Italy has to offer, both events have several new features this year, including new dates for both, a prestigious new host town in Cortina d’Ampezzo for the Haute Route Dolomites and a Duo-only competition format for the Haute Route Stelvio. Kicking off the European season in June (June 7 to 9), the Haute Route Dolomites returns for its second edition in the 3-day format, moving to the new and prestigious host town of Cortina d’Ampezzo. Possibly the most luxurious ski resort in Italy, Cortina d’Ampezzo is the ideal location for hosting this event in the heart of the Dolomites. The totally revampped course includes iconic cols such as the Passo Pordoi and Passo Sella as well as two ascents of the Passo Falzarego, a unique summit finish on Tre Cime di Lavaredo and a time trial up Passo Giau. Taking place at the end of the summer in Bormio, the Duo-only Haute Route Stelvio also returns for a second edition from the 20th to 22nd of September. Featuring climbs up the Umbrail Pass, Passo Mortirolo and Passo Gavia the course also includes a summit finish on the Passo Dello Stelvio (from Prato allo Stelvio) on stage one and an uphill time trial on the Stelvio (from Bormio) on the final day. Based in the mountain-resort of Cortina d’Ampezzo, the 2019 Haute Route Dolomites returns for a second edition in the 3-day format. Kicking off the European Haute Route calendar in June, it’s the perfect opportunity to get your season started in a stunning location. Surrounded by the jagged snow-capped peaks, you are guaranteed a weekend of cycling to remember. The first stage of the Haute Route Dolomites begins with an ascent up the Passo Falzarego straight from the gun, heading to 2105m above sea level. Following a steep descent and short plateau in the valley, riders will then take on a succession of three climbs over the Passo Pordoi, Passo Sella and Passo Gardena, each topping out above 2100m and offering a different challenge as well as unique views over the Dolomites. A longer descent back to the valley ensues before the climb up to Passo Valparola for a summit finish to end this first stage. Crossing the finish line at the summit, riders will have conquered five of the Dolomites most famous climbs in the space of just 97km, each topping out above 2100M metres! 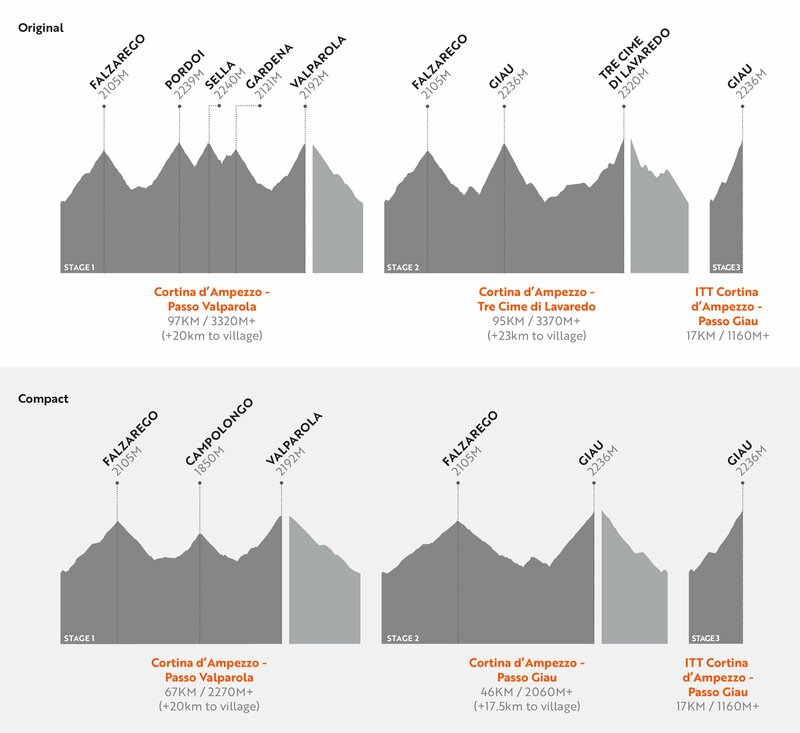 The Compact course on this first day features the same ascent up the Passo Falzarego, before heading over the Passo Campolongo and straight to the summit finish on Passo Valparola. Featuring an identical start to the first day, stage 2 heads up the Passo Falzarego again, and once the riders crest the summit they will descend back into the valley and head towards another giant of the Dolomites, the Passo Giau. This long and steep ascent to 2236m will test the riders resolve before they take on a long portion of rolling hills heading into the final climb of the day. A first for the Haute Route, the final climb of the second stage will take riders up to the summit of the iconic Tre Cime di Lavaredo. Standing tall above the valleys below, these three peaks are probably the most recognisable landform of the Dolomites, riders will undoubtedly get to experience something truly unique on this second stage. The Compact course on stage two will cover the same route as the Original course but finish on Passo Giau after just 46km of riding. Bringing the event to a close in style, the third and final stage of the 2019 Haute Route Dolomites is an uphill time trial on the Passo Giau. Having already climbed this mountain from the opposite side on the second stage, astute riders will have had an opportunity to recce the climb as they descended the previous day. Starting in Cortina d’Ampezzo, this 21km climb rises 1540M to the summit at 2236M above sea level. With several long portions around 10% gradient and only one short plateau to recover half way up, this final-stage race against the clock will be the last test that riders will have to overcome before calling themselves finishers. Based in the town of Bormio at the foot of Passo Dello Stelvio, the Duo-only Haute Route Stelvio returns for a second edition from the 20th to 22nd of September. Featuring three of the biggest col-names in all of Italian cycling (Passo Dello Stelvio, Passo Mortirolo, Passo Gavia), the 2019 event is a perfect opportunity to team up with a friend and tick off these iconic climbs from your bucket list together. Starting in the heart of old-town Bormio, the first stage of the Haute Route Stelvio heads straight up the Umbrail Pass, with just a few kilometres in the valley to get the legs warmed up, riders will be thrown straight into the heart of the action on this first climb. Turning left at the summit and descending over the border into Switzerland, the route then snakes around the foot of the mountain all the way to Prato Allo Stelvio where it turns back uphill for the second climb and summit finish atop Passo Dello Stelvio. This 24km ascent features the picturesque switchbacks that the Passo Dello Stelvio is known for, as well as steep slopes and stunning viewpoints over the snowcapped peaks in the distance. The Compact course on this first stage begins in Tubre and features an initial flat section through the valley before an ascent up Passo Dello Stelvio for a total of 40km and 1860M of climbing. The second stage of the 2019 Haute Route Stelvio begins with a long false flat downhill into the foot of the Passo Mortirolo. Don’t be fooled by this relatively easy start to the stage, as the first ascent of the day takes on the toughest side of Passo Mortirolo and promises to test the riders tired legs after a demanding ride on the first stage. Topping out at 1852M above sea level, the Passo Mortirolo features the steepest slopes of the weekend and should be ridden within one’s limits to avoid burning too many matches. Following the descent, a long section of uphill false flat uphill ensues before a summit finish climb up Passo Gavia. Similar to the previous day, riders will reach an altitude of 2652M at the summit, and are likely to feel the effects of altitude late on in the stage. The Compact course on stage two begins in Vezza d’Oglio and features just the one climb up Passo Gavia. The final stage of the Haute Route Stelvio is an uphill time trial on the Passo Dello Stelvio. Starting from Bormio, only 21km and 1540M of climbing will separate the riders from the finish line at the summit. Riders will be able to break the climb down into three sections, an initial steep part for the first 8km, followed by a short plateau and a middle section with shallower gradients before the road ramps up in the final 3km to an average of nearly 11% before reaching the finish line. Crossing the finish line at the top, riders will have earned their mantle as Haute Route Finishers, and will be able to enjoy the glory of their incredible achievements.